Get out of the house and wander through the 45th Annual Bay Women’s Club Antiques Show this Presidents Day weekend. Following a long tradition, the show hosts area dealers who bring a wide variety of antiques and vintage items from the 1960s and older. Besides what is on hand, dealers can tell you about other options they might have available. Be different (or have people already said you are! ): Give your home a personal touch with unique items not found at mass-merchandise stores – lamps, pottery, glass, figurines, linens. Check out the “repurposed” items – old items made into something newer. And then there’s the unique jewelry that crosses generations. An educational experience: Dealers and our appraisers can explain factors in valuing antiques (age, rarity, condition, etc.). And dealers can provide resources for refurbishing your antiques – refinish, upholster or cane furniture; restore leaded glass; repair lamps and clocks, and much more. Don't put away that train yet! Playing with model trains just got easier. YOU get to drive the trains on an operating model train layout at the show. Better yet, bring your own American Flyer “S” gauge train and run it on this multi-track, tin-plate layout, typical of layouts parents built for their kids in the 1950s. The layout is courtesy of the Cuyahoga Valley “S” Gauge Association. 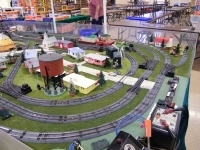 Around since the 1940s, CVSGA promotes the fun of modeling trains and supports charitable activities with its transportable running train layouts. Members will be on hand to answer questions about maintaining trains and factors in valuing collections. Old trains in the attic? Bring any type of train and CVSGA has equipment to test whether the train will still run. Maybe you’ll be motivated to put up a display next Christmas! So drop in Bay High School, Saturday, Feb. 15, 10 a.m.-4 p.m., and Sunday, Feb. 16, 11 a.m.-4 p.m. Bring one item for a free appraisal: jewelry from 1-3 p.m. on Saturday; antiques from 1-3 p.m. on Sunday. Bring your “S” gauge train to run on the model train display. Or bring kids so you can pretend you’re "showing them" how to run the trains on the working model display. We’ll also have a concession stand, bake sale, Bay memorabilia, plant sale and raffle drawing (from your paid ticket). Hosted by The Bay Village Women’s Club, your $5 donation (children under 12 free) supports our Bay High scholarship fund. See www.BayWomensClub.org or leave a message at 440-334-7539. Bay Village Women's Club is a non-profit social and charitable organization that supports needs in the city of Bay Village.